Petit Verdot - City Vino, Inc. The Petit Verdot (PV) grape’s origins in France date back to the 16th/17th century. The grape is believed to be the child of a grape called Balisca, which originated in Albania, and it was believed to have been brought to France by either the Romans or Greeks. 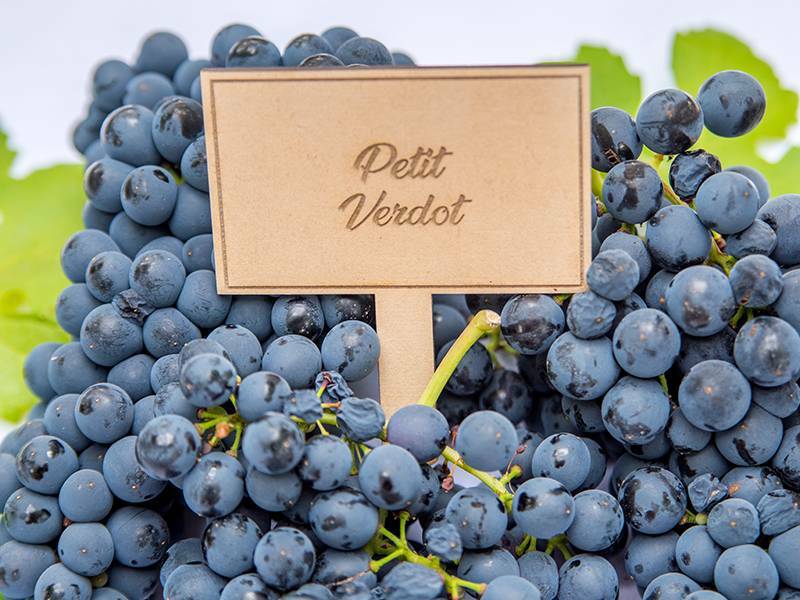 The name “petit verdot” translates as “little green.” The grapes are very small, and are late ripening, so they stay green for a long period of time—hence their name. Because of their small size and their thick skins, and the relative proportion of flesh-to-skins, wines made from this grape will be tannic and dark. They grow better with hot days, which allow ample warmth for ripening, but also cooler nights to slow down loss of acidity in that daytime heat. Wines made from PV are usually full bodied with high tannins and good acidity, and have a dense, inky, violet-black color. The high tannins and good acidity mean that wines made from this grape have great aging potential. Dominant flavors in a PV are blackberry, black cherry, plum, violet, lilac and sage. Wines made from PV can often have aromas of pencil shavings, molasses or tar, too. With bottle age, the wines can have aromas/flavors of cedar or cigar box. There are about 18,000 acres of PV worldwide. The grape is grown in France, the USA, Australia, Spain, South Africa, Chile, Argentina, as well as other places. It is one of the grapes allowed in a Bordeaux blend in France, but usually makes up only about one to two percent of the blend. Single varietal wines from Petit Verdot are often found in the United States (including Virginia! ), Spain, Chile, and Australia. PVs from the U.S. are fruit-forward, and include aromas and flavors of blackberry, sage and violet. Spanish PVs are dark wines, with black fruit flavors and notes of licorice and black pepper. Chilean PV tends to be deep in color with aromas of blackberry and black currants, with a hint of roasted coffee, but can also be herbaceous depending on the vintage. PVs from Australia tend to be lighter in body and color, with aromas and flavors of black cherry, black raspberry, and violets, because they tend to be overcropped (vineyards allow lots and lots of clusters to grow, yielding a less-concentrated flavor).